The Dow Jones Industrials closed at 15303.10 closing below initial support at 15325 yet holding 15125. The primary support lies at 14390. A weekly closing BELOW that level will signal a short-term correction is underway. The nonsense spouted out by domestic analysts that the market has rallied because the Fed easing is just gibberish. Japan did that for 23 years and it did nothing but bankrupt the country. Lower interest rates make pension funds insolvent and the benefits have not been passed on by the banks. They pay 0.5% for 3 year deposits yet charge 4% for a fully secured car loan. Margin rates charged by brokers have also failed to drop in proportion to the rate decline at the Fed. So the rates have NOT been passed on killing that absurd fundamental explanation. The spread between bid and ask on money is at a historical high. Applying this spread to the peak in rates when the Fed discount rate was 14% in 1981 would be like the banks charging 112%. The market has risen on pure capital inflows. European capital is buying up real estate in the USA as well trying to get money out of the banking system and out of the EU. We verify EVERYTHING and question the most basic assumptions. What emerges is typically gibberish. Here is call money on the NYSE (rate of interest charged in borrowing on stock). You see the 1929 rally, which was percentage the greatest rally, took place with the LOWEST spike high in interest rates because it was a capital INFLOW. 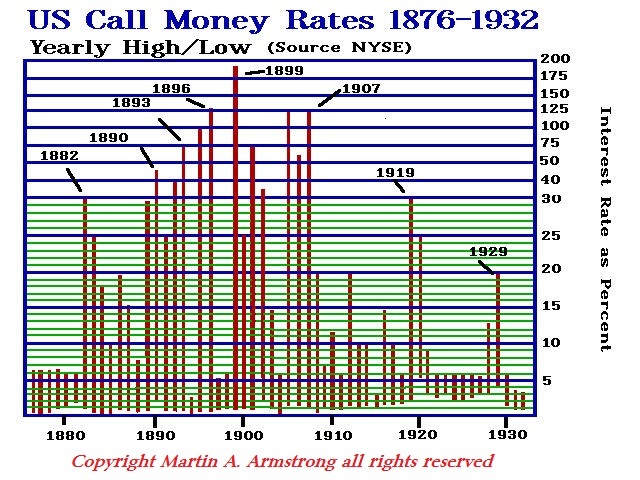 The highest rates in 1899 came 3 years after the USA needed to be bailed out by J.P. Morgan. Capital inflows from Europe made the Roaring ’20s roar. Until domestic analysis wakes up there is little hope either for the Fed or forecasting in the USA. Unless you monitor the world, you will be blind to the real events taking place. The 1720 Mississippi Bubble and South Sea Bubble were about investing from Europe in foreign markets. 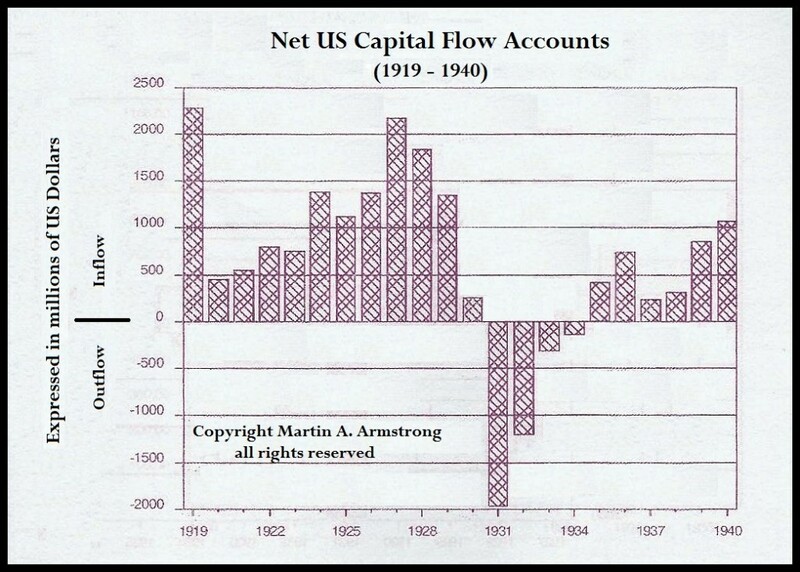 International capital flows have been going on for a very long time. Even Cicero wrote how Brutus was lending money to cities in Turkey at 40%. The rally from the October 2002 low in the Dow into the October high 2007 was 60 months. We are approaching 51 months. While there is room to make a short-term correction where all the talking heads proclaim how they picked the high, we may see the US market do a 72 to 78 month bull run before a change in trend really takes place. 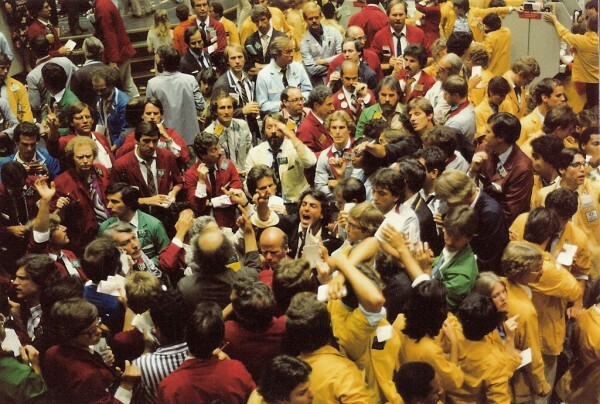 They will give us a high by March or October 2015.The Roaring ’20s was a full 96 month bull run. ONLY a monthly closing BELOW 12850 would signal a change in trend.